At the age of sixteen, when he was in Germany, he hit upon the wild project of passing for a Formosan. He recollected, that he had heard the Jesuits speak much of China and Japan; and was rash enough to think, that what he wanted of a right knowledge, he might make up by the strength of a pregnant invention, which here, it must be confessed, found ample scope for employment. He set himself to form a new character and language, a grammar, a division of the year into twenty months, a new religion, and whatever else was necessary to support the deceit. His alphabet was written from right to left like the Oriental tongues and he soon inured his hand to write it with great readiness. He now thought himself sufficiently prepared to pass for a Japanese converted to Christianity he altered his Avignon certificate as artfully as he could re-assumed his old pilgrim’s habit, and began his tour, though with a heavy heart, to the Low Countries. 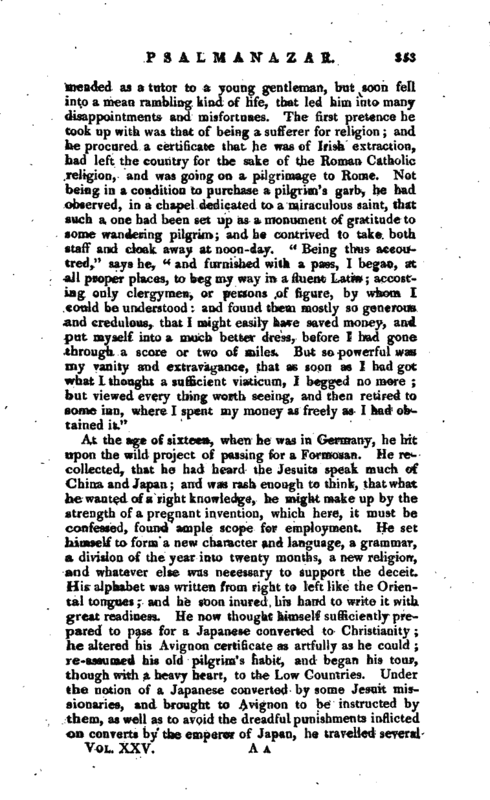 Under the notion of a Japanese converted by some Jesuit missionaries, and brought to Avignon to be instructed by them, as well as to avoid the dreadful punishments inflicted on converts by the emperor of Japan, he travelled several | hundred leagues, with an appearance, however, so dismal and shabby, as to exceed even the common beggars. At Liege he enlisted into the Dutch service, and was earned by his officer to Aix-la-Chapelle. 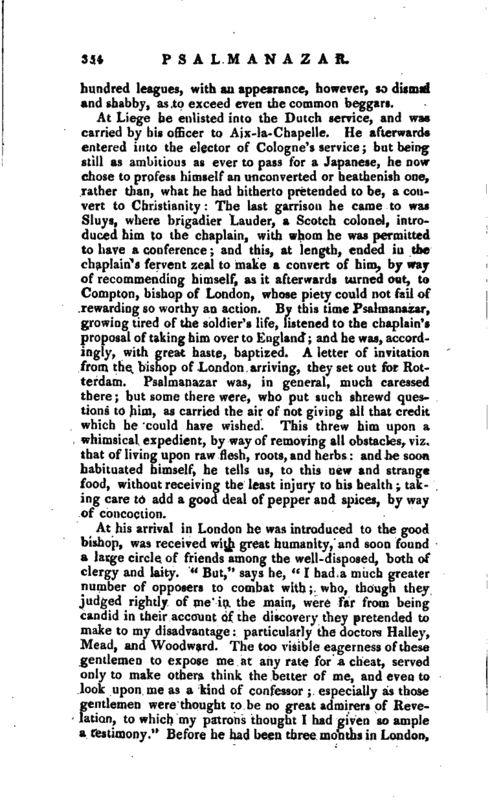 He afterwards entered into the elector of Cologne’s service; but being still as ambitious as ever to pass for a Japanese, he now chose to profess himself an unconverted or heathenish one, rather than, what he had hitherto pretended to be, a convert to Christianity: The last garrison he came to was Sluys, where brigadier Lauder, a Scotch colonel, introduced him to the chaplain, with whom he was permitted to have a conference; and this, at length, ended in the chaplain’s fervent zeal to make a convert of him, by way of recommending himself, as it afterwards turned out, to Compton, bishop of London, whose piety could not fail of rewarding so worthy an action. By this time Psalmanazar, growing tired of the soldier’s life, listened to the chaplain’s proposal of taking him over to England; and he was, accordingly, with great haste, baptized. A letter of invitation from the bishop of London arriving, they set out for Rotterdam. Psalmanazar was, in general, much caressed there; but some there were, who put such shrewd questions to him, as carried the air of not giving all that credit which he could have wished. This threw him upon a whimsical expedient, by way of removing all obstacles, viz. that of living upon raw flesh, roots, and herbs: and he soon habituated himself, he tells us, to this new and strange food, without receiving the least injury to his health; taking care to add a good deal of pepper and spices, by way of concoction. At his arrival in London he was introduced to the good bishop, was received with great humanity, and soon found a large circle of friends among the well-disposed, both of clergy and laity. “But,” says he, “I had a much greater number of opposers to combat with; who, though they judged rightly of me in the main, were far from being candid in their account of the discovery they pretended to make to my disadvantage: particularly the doctors Halley, Mead, and Woodward. The too visible eagerness of these gentlemen to expose me at any rate for a cheat, served only to make others think the better of me, and even to look upon me as a kind of confessor; especially as those genjtlemen were thought to be no great admirers of Revelation, to which my patrons thought I had given so ample a testimony.” Before he had been three months in London, | he was cried up for a prodigy. He was presently sent to translate the church-catechism into the Formosan language; it was received by the bishop of London with candour, the author rewarded with generosity, and his catechism laid up amongst the most curious manuscripts. It was examined by the learned; they found it regular and grammatical; and gave it as their opinion, that it was a real language, and no counterfeit. After such success, he was soon prevailed upon to write the well-known " History of Formosa/' which soon after appeared. The first edition had not been long published, before a second was called for. 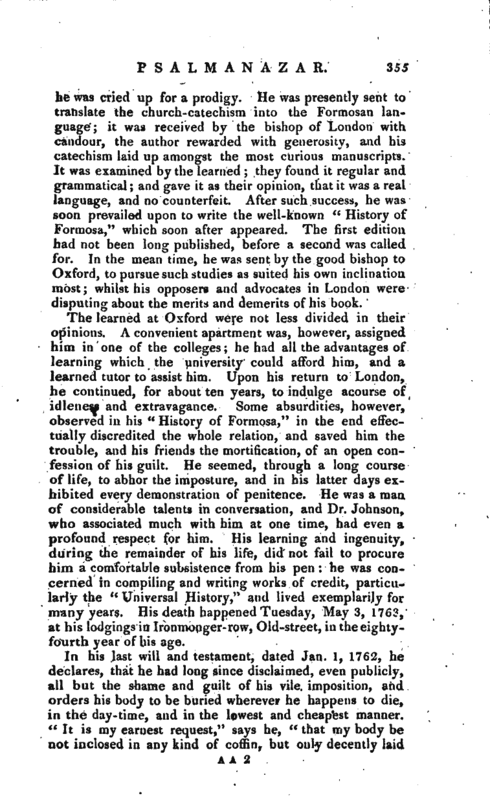 In the mean time, he was sent by the good bishop to Oxford, topursue such studies as suited his own inclination most; whilst his opposers and advocates in London were disputing about the merits and demerits of his book. The learned at Oxford were not less divided in their opinions. A convenient apartment was, however, assigned him in one of the colleges; he had all the advantages of learning which the university could afford him, and a learned tutor to assist him. Upon his return to London, he continued, for about ten years, to indulge acourse of idleness and extravagance. Some absurdities, however, observed in his “History of Formosa,” in the end effectually discredited the whole relation, and saved him the trouble, and his friends the mortification, of an open confession of his guilt. He seemed, through a long course of life, to abhor the imposture, and in his latter days exhibited every demonstration of penitence. He was a man. of considerable talents in conversation, and Dr. Johnson, who associated much with him at one time, had even a profound respect for him. 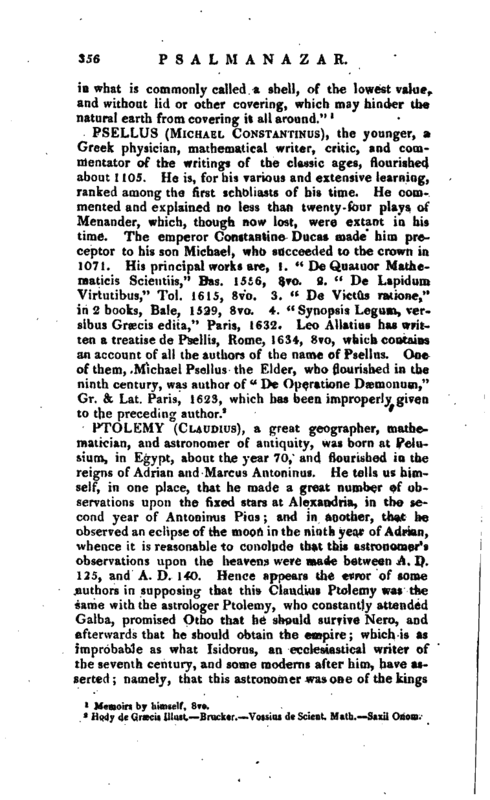 His learning and ingenuity, during the remainder of his life, did not fail to procure him a comfortable subsistence from his pen: he was concerned in compiling and writing works of credit, particularly the “Universal History,” and lived exemplarily for many years. 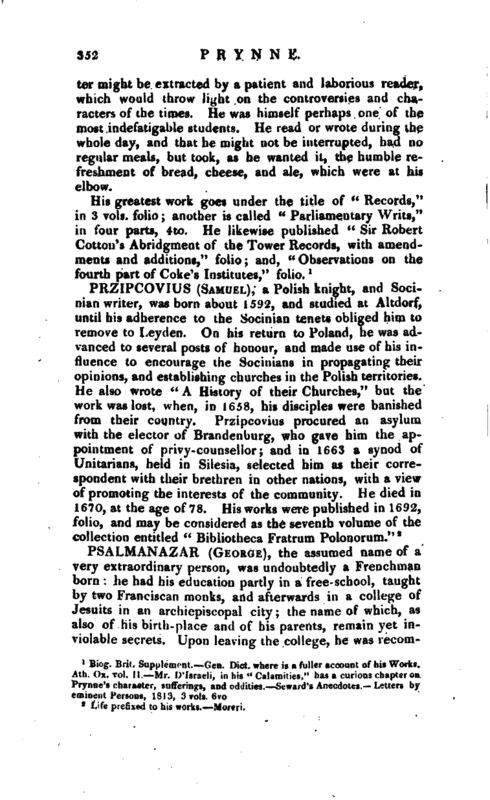 His death happened Tuesday, May 3, 1763, at his lodgings in Ironmonger- row, Old-street, in the eightyfourth year of his age.